We are a family business and have been in the futon industry for over 30 years. Our futons, bolsters and futon cushions are made exclusively for us by us. They are all hand made to ensure premium quality and our futons and futon cushions are hand tufted to ensure no tearing of fabric. We use only the best fills available: …quality Australian wool …solid foam (not crumbed)…natural latex….pure carded (combed) cotton (not loose fill) and quality coconut fibre – coir (bonded with natural latex). We are happy to customise your futon order to your specific needs (caravans, daybeds etc.). 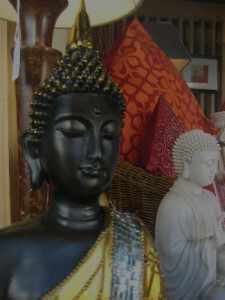 We are also well known for our quality shiatsu mats, cotton bolsters, cot mattresses & futon cushions. We have also introduced natural latex and/or coconut fibre inner core to our futon range (ask staff for details). As well as our wide range of futon mattresses, bed bases, bedside tables, tallboys, sofa beds and natural latex mattresses we also stock quilts and sheet sets…pillows …soft furnishings…buddhas… and much more. 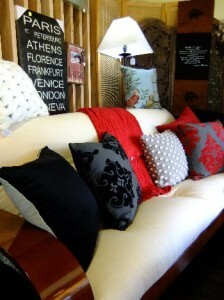 We also stock a wide range of the latest cushions and throws to help you complete the decorating look you desire. We are happy to do special package deals (in shop only). For one stop shopping we have all your bedding and furnishing needs. Our friendly staff have great product knowledge and will also assist with colour matching.